The hype for Sorensen Stables’ THE HUNT European Hunter Auction, the first of its kind, reached its pinnacle the evening of Monday, November 13 as equine enthusiasts from around the world attended or tuned in to the live spectacle. 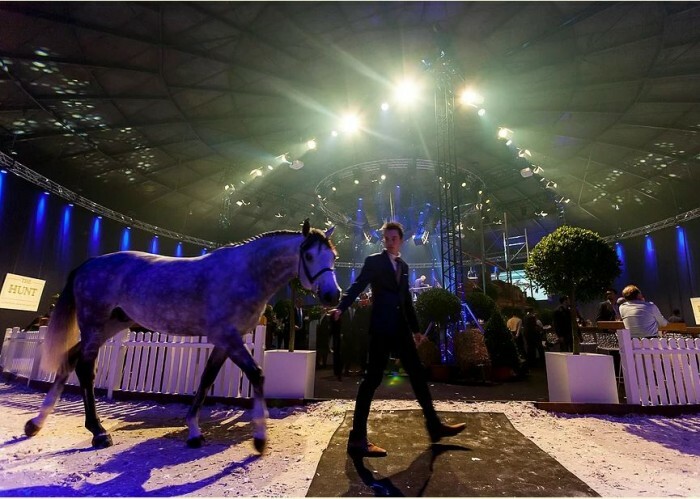 The hotly-anticipated event featured an elegant horse presentation, fine dining, a competitive auction and a festive after-party, resulting in a memorable night for all, especially those leaving the Netherlands with a new horse or two in tow. The hardworking Sorensen trio, comprised of Chris, Whitney and Will, spared no expense planning for THE HUNT, and both announcer Pedro Cebulka and auctioneer Andrew Nolan enhanced the experience with their charismatic talents. VIP guests were treated to a gourmet dinner and cocktails, and as a cheeky addition to the affair, local pony riders showcased their talents during the auction preparation, racing around the outskirts of the unique Gashouder venue in brilliant fashion. Commencing the main phase of the night, the auction firstly featured a surprise entrant, the aptly-named Wild Card, a miniature horse of tiny proportions. With proceeds from the sale of Wild Card benefiting the ever-popular Danny & Ron’s Rescue, the crowd was eager to raise funds, ultimately earning the dog rescue organization €6,000, a philanthropic start to the main event. From the next 14 stallions and geldings that were thrillingly auctioned, THE HUNT accumulated total sales of €1,120,000, with the average sale price resting at €80,000. For fortunate new horse owners, the white glove service continued long after their purchase. Not only were owners treated to a beautiful photo opportunity, a plaque of their new horse and a bottle of champagne for the table to share, but THE HUNT had already impressively handled all the necessary travel logistics. Pre-booked flights, castrations, appointments and quarantine made for a seamless export from door-to-door, so purchasers can revel in their new steed worry-free. Armed with the ideal that everyone from potential buyers to everyday horse lovers could readily view the auction and experience the spectacle of THE HUNT, the Sorensen team ensured to incorporate a live stream of festivities into their offerings. With excitement for the evening widespread, more than 700 individuals from 30 countries tuned in to the live stream of the horse presentation and auction to witness the debut THE HUNT in addition to the local and international guests lucky enough to be in attendance. THE HUNT made sure not to forget those interested parties who could not be present, and offered personal representatives to phone bidders. With 14 future stars slated to enter the show ring in North America, competitors can anticipate a few new contenders in the hunter divisions at upcoming shows. With a whole year ahead of them to curate another premier collection of horses, Sorensen Stables plans to bring another crop of rising stars to auction next year, sure to shake up the hunter market once again. Though the inaugural THE HUNT has concluded, the equestrian community can expect the popular event to return for its second year in 2018, and if the success of the first year is any indication, guests should prepare for an even more enthralling evening the second time around.